It is the policy of Kitsap Transit to assure that no person shall, on the grounds of race, color or national origin, as provided by Title VI of the Civil Rights Act of 1964, be excluded from participation in, be denied the benefits of, or otherwise be discriminated against under any of its federally funded programs and activities. Any person who believes his or her Title VI protection has been violated may file a complaint with Kitsap Transit's Human Resources Director by calling (360) 478-6227. Es política de Kitsap Transit asegurar que ninguna persona, por motivos de raza, color o nacionalidad de origen, según lo dispuesto en el Título VI de la Ley de Derechos Civiles de 1964, sea excluida de la participación en, se le nieguen los beneficios de, o de otra manera sea discriminada en virtud de cualquiera de sus programas y actividades financiados por el gobierno federal. Cualquier persona que crea que su protección de Título VI ha sido violada, puede presentar una queja ante el departamento de Recursos Humanos de Kitsap Transit. Para quejas sobre el Título VI e información adicional, llame al (360) 377-2877. Patakaran ng Kitsap Transit na tiyakin na walang sinuman, sa batayan ng lahi, kulay o bansang pinagmulan, tulad ng nakasaad sa Titulo VI ng Batas ng mga Karapatan bilang Mamamayan ng 1964 (Title VI of the Civil Rights Act of 1964), ang hindi isasama sa pakikilahok sa, ang tatanggihan ng benepisyo ng, o di kaya’y didiskriminahin sa ilalim ng anumang mga programa at aktibidades na pinondohan ng pederal. Sinumang naniniwala na ang kanyang proteksyon sa ilalim ng Titulo VI ay nilabag ay maaaring magsampa ng reklamo sa Human Resources Department ng Kitsap Transit. Para sa mga reklamo na may kaugnayan sa Titulo VI at karagdagang impormasyon, mangyaring tawagan ang numerong: (360) 377-2877. The Google Transit trip planner featured on kitsaptransit.org is powered by Google. Google Transit enables you to enter the specifics of your trip, like your origin and your destination, and the time of day you'd like to leave and/or arrive, and then uses all available public transportation schedules and information to plot out the most efficient step-by-step transit itinerary. You can even compare the cost of your trip with the cost of driving the same route. Advance options are also available to help customize your route based on your personal preferences. For example, you might not mind a longer journey if it means few transfers or less walking time. You can specify these preferences and alter your route results by clicking the “Show options” link below your destination. Kitsap Transit strives to provide quality information through Google Transit, but cannot guarantee 100% accuracy. Google and participating transit agencies will continue working together to improve the product quality. It is recommended that riders double-check trip itineraries with the published bus schedules available on kitsaptransit.org. Please see the Google Transit Terms and Conditions. If your trip itinerary has inaccurate stop locations, times, fares, or service schedule information, it's probably because of misinformation between Kitsap Transit and Google Transit. Record the origin, destination and arrival/departure date and time for your itinerary and use the link below to provide information to Kitsap Transit about the problem you experienced. Only through your continued use and feedback can we make Google Transit better for everyone. Use the “link” feature on the top right corner of the Google Transit map and then use your “copy” function to paste the link into an email and we will fully investigate. Riders should be aware that Google Transit trip planning doesn't reflect temporary changes in a route such as when a bus is detoured due to construction or when buses are running on snow routes during bad weather. Fares reflected for Kitsap Transit trips are for cash paying riders. Riders paying with ORCA card E-purse are entitled to free transfers and may pay less. Google Transit may provide two or three suggested trip plans. We recommend you always check these alternative itineraries as they may provide a trip that better meets your needs. Advance options are also available to help customize your route based on your personal preferences. For example, you might not mind a longer journey if it means few transfers or less walking time. You can specify these preferences and alter your route results by clicking the “Show options” link below your destination. Walking directions and times can be inaccurate, sometimes suggesting walking across un-passable obstacles. Always choose the safest approach for your location. Google Mobile supports viewing of Google Maps on iPhone, Blackberry, Windows Mobile, S60, and other Java enabled phones. Visit this link at Google Maps Mobile. Kitsap Transit trademarks, symbols and logos, including any confusingly similar variants, may not be used in association with Data. Commercial use of Kitsap Transit materials is expressly prohibited without the written permission of Kitsap Transit. Data is provided on an "as is" and "as available" basis. 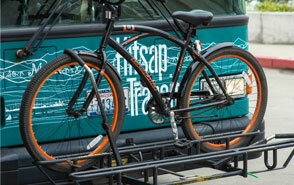 Kitsap Transit makes no representations or warranties of any kind, express or implied. Kitsap Transit disclaims all warranties, express or implied, including but not limited to implied warranties of merchantability and fitness for a particular purpose. Kitsap Transit and its employees, officers, directors and agents will not be liable for damages of any kind arising from the use of Data including but not limited to direct, indirect, incidental, punitive and consequential damages. Kitsap Transit reserves the right to alter and/or no longer provide Data at any time without prior notice. Kitsap Transit maintains title, ownership, rights and interest in and to Data. By using Kitsap Transit Data, you agree to be bound by all of the Terms and Conditions set forth in this Agreement. The laws of the State of Washington shall govern all rights and obligations under this Agreement, without giving effect to any principles of conflicts of laws. This Agreement constitutes the complete and exclusive agreement between the KITSAP COUNTY PUBLIC TRANSPORTATION BENEFIT AREA AUTHORITY and User with respect to the subject matter hereof and supersedes all prior oral or written understandings, communications, or agreements not specifically incorporated herein. The KITSAP COUNTY PUBLIC TRANSPORTATION BENEFIT AREA AUTHORITY reserves the right to modify or revoke this Agreement at any time. Data that Kitsap Transit uses to supply Google Transit is posted at https://transit.land/ or http://transitfeeds.com.